No matter what the musical genre—rhythm and blues, rock 'n' roll, surf, jazz, movie themes, crooning standards—you just name it, and you can bet that saxophonist Plas Johnson has played on the songs that all but define it. Mind-boggling is not the word. Impossible-but-true might be a little more like it. Most closely associated with Henry Mancini's "Pink Panther" and "Peter Gunn" themes, Plas has played on records by everyone from West Coast R&B kings Floyd Dixon, Don and Dewey, Roy Tann and Johnny "Guitar" Watson to rock 'n' roll legends Ricky Nelson, Fats Domino and Larry Williams. Let's not forget Frank Sinatra, the Beach Boys, Tom Waits, the Monkees and Frank Zappa. Plas should be sainted for playing on the Cadets' "Stranded In The Jungle," Screamin' Jay Hawkins' "Constipation Blues" and Johnny Otis's "Willie and the Hand Jive" alone, but then there's Sheb Woolley's "Purple People Eater" and the list, as they say, just go on and on and on…. It's really hard to even know where to begin. The man is truly the Earl Palmer of the saxophone. And like Palmer—and seemingly just about everyone else in the early rock 'n' roll biz—Johnson hailed from Louisiana, Donaldsonville to be exact. 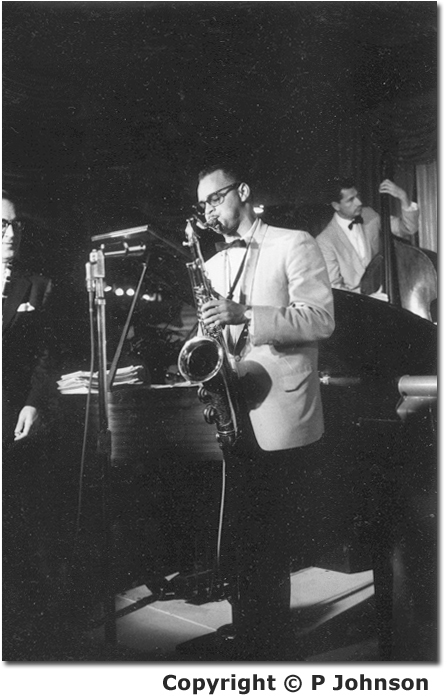 It was there that he formed the Johnson Brothers Combo, with whom he first recorded in 1947 for the DeLuxe imprint. By 1951, he'd done a stint with Charles Brown and joined the Army. Discharged on the West Coast, he was the right man at the right place at the right time. And he still is.